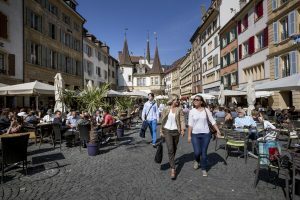 Situated between Lake Neuchâtel and the Jura mountains and dominated by the Château and the Collégiale, the WFC 2019 host city boasts a network of charming pedestrian streets that lead visitors from discovery to discovery (Place des Halles, Hôtel DuPeyrou, Quai Ostervald, numerous fountains, fascinating museums – natural history museum, art and history museum with its Jaquet-Droz automata, ethnographic museum). More recent accomplishments on the city’s outskirts round off the range of attractions. Perched high above Neuchâtel, a few steps away from the botanical garden, the Dürrenmatt Centre designed by architect Mario Botta is home to the famous author’s literary and pictorial work. 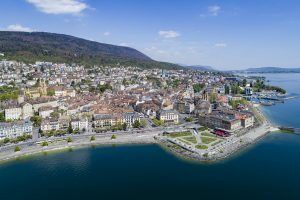 On the lakeshore at Hauterive, the Laténium – Archaeological park and museum – explores 50,000 years of prehistory and history in a series of extraordinary settings.